The octagon is the pattern trend of the year! This is a beautiful octagon monogram embroidery font in smaller sizes. Capital letters A thru Z, with left, middle and right letters to form an octagon shape as shown. 6 sizes included: 1.00, 1.50, 2.00, 2.50, 3.00 and 3.5 inches. Size refers to the tallest height of the middle letter in the set. 1 inch: .95 x 1.00 inches. SC: Avg: 1134. Satin stitch. 1.50 inch: 1.43 x 1.50 inches. SC Avg: 1781. Satin stitch. 2.00 inch: 1.91 x 2.00 inches. SC: Avg: 2459. Satin stich. 2.50 inch: 2.38 x 2.50 inches. SC: Avg: 3266. Satin stitch. 3.00 inch 2.86 x 3.00 inches. SC: Avg: 4677. Satin stitch. 3.50 inch 3.34 x 3.50 inches. SC: Avg: 5689. Satin stitch. The octagon is the pattern trend of the year! 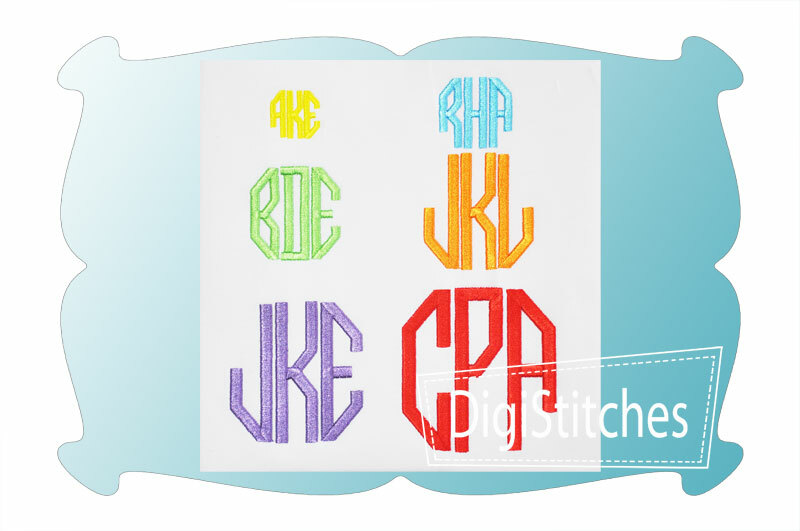 This is a beautiful octagon monogram embroidery font in smaller sizes.